And iTunes U isn't just for Stanford alumni. Anyone can download tracks to a computer or mp3 player (like an iPod) and use iTunes to listen. Though it's been "live" since October 2005, this is our first big marketing push to alumni. It is a public site, so anyone can access it, and we have been averaging over 15,000 downloads a week. So far, though, Stanford can't track what fraction of users are alumni. Meanwhile, Stanford has structured the site to give departments and schools a "home" for their content. "So far," says Cindy, "the alumni response has been very positive." The partnership is a good example of entrepreneurial spirit combined with a societal trend. Alumni doing something anyway? Figure out a way your organization can participate in a way that makes sense to everyone. 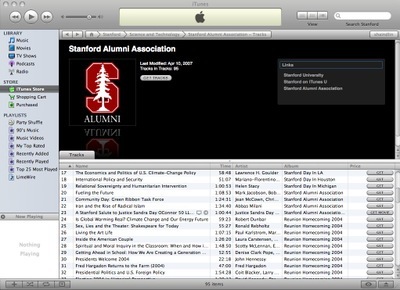 Putting academic content into the iTunes pipeline puts Stanford's unique content in the hands of alumni - and the public at large. 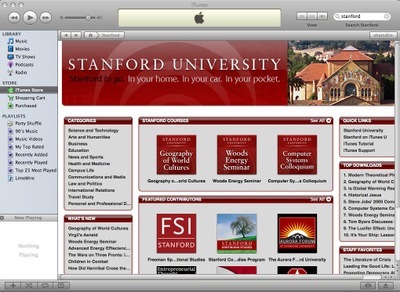 Rewind: Forbes Magazine covered Stanford's iTunes move back in January of 2006. Click images for larger screenshots of the main Stanford page in iTunes (top) and the Alumni Association's content (bottom).